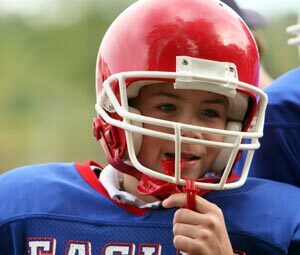 Whether you wear braces or not, protecting your smile while playing sports is essential. Mouthguards help protect your teeth and gums from injury. If you participate in any kind of full-contact sport, the American Dental Association recommends that you wear a mouthguard. Choosing the right mouthguard is essential. There are three basic types of mouthguards: the pre-made mouthguard, the “boil-and-bite” fitted mouthguard, and a custom-made mouthguard from your dentist. When you choose a mouthguard, be sure to pick one that is tear-resistant, comfortable, and well-fitted for your mouth, easy to keep clean, and does not prevent you from breathing properly. Your dentist can show you how to wear a mouthguard properly and how to choose the right mouthguard to protect your smile. If you are in need of our mouthguard and nightguard services, please contact our Grand Rapids dentist at (616) 288-6134. At NorthPointe Family Dental, we want to make sure you receive the protective dental care that you need!